I’m not a football fan at all, but I love football players and if there’s one I love, then its David Beckham , I like him for no reason!! Lol!! But I think I have gotten another favorite and he is no other person but KAKA!!! I have heard the name severally and so I decided to do a background check on him,with the help of google and other sources. What triggered my love for this footballer is his Love for JESUS CHRIST. Its so amazing especially in a world where our celebrities think they don’t need CHRIST. Kaka whose real name is Ricardo Lzecson Dos Santos Leite , was born to a middle-class family in Brasilia on the 22nd of April 1982 , he’s just 31years. He became spiritually engrossed when he was just 12. He said “I learnt that it is faith that decides whether something will happen or not”. At the age of 18, he suffered a career-threatening and possibly paralysis-inducing spinal fracture as a result of a swimming pool accident, but he remarkably made a full recovery and that was the turning point of his Christian faith as he attributes his recovery to God and has since tithed his income to the Church. “I need Jesus every day of my life. Jesus tells me in the Bible that, without Him, I can’t do anything. I really believe that without Jesus, we can’t do anything. The gift and ability I have today to play football is because God gave it to me. It is a gift from God that I try to improve on every day. That is why I need Jesus in my life every day. The difference Jesus makes in my life is that I know I will always have victory. I will always have joy and I will always have success. This is independent of the situations I face, because I know that in the end, there will be greater victory. This brings me great peace, serenity, tranquility and happiness because I am sure that Jesus is in control of my life. To think that he was the world’s highest paid footballer and best player before C.Ronaldo. He removed his Jersey to reveal an “I Belong To Jesus” T-shirt and openly engaged in prayer moments after the final whistle of Brazil World Cup 2002 and Millian’s 2004 Scudetto and 2007 Champions League Triumph. 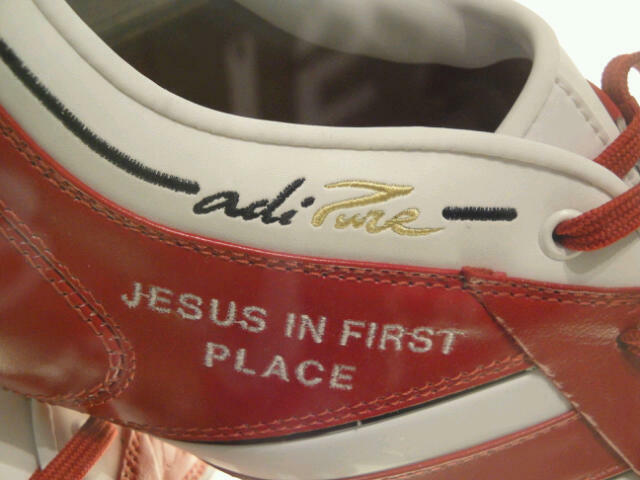 He also had the same Phrase , “God is Faithful” stitched onto the tongues of his boots. 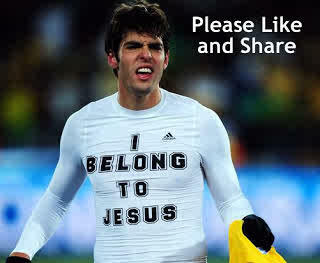 In the Federation Cup he and several of his team mates wore T-shirts that read “Jesus Loves You” in various languages. He believes God gave him more than he could ever ask for. In goal Celebrations he usually points to the sky as a gesture of thanks to God. Kaka’s favourite music is gospel and his favourite book is the Bible. Kaka, 26, has won a World Cup and the Champions League as well as been named FIFA World Player of the Year. I could go on and on about KAKA, he has worked with great men like BILLY GRAHAM in a campaign where Hundreds of people were freed from demonic possession. Hardened criminals turned to Christ in thousands. Many more were cured of booze and drug addictions. A former voodoo princess turned to Christ. Kaka, who applied the biblical rule of sexual morality is happily married to Caroline, his childhood sweetheart and they have 2 wonderful kids (a boy and a girl).